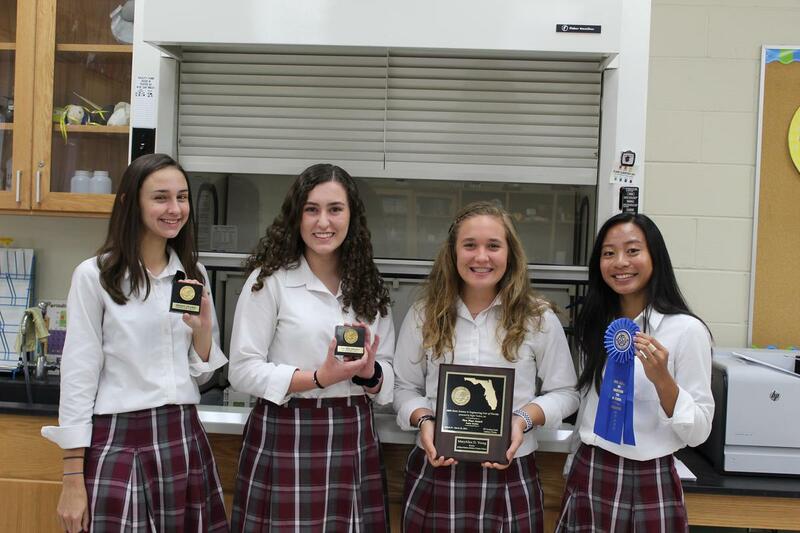 Congratulations to Bishop Kenny students Mailene Miranda ‘21, Lauren Massais ‘21, Lily England ‘20, and MaryAlice Young ’20 for being award recipients at the 2019 State Science and Engineering Fair of Florida, held March 26—28 at The RP Funding Center in Lakeland, Florida. 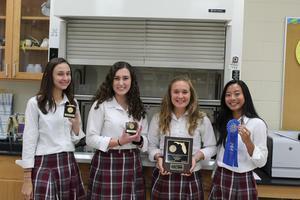 Ten bishop Kenny students qualified for this renowned pre-college science competition where students from throughout the state vied for top honors and a chance to qualify for the Intel International Science and Engineering Fair. There were over 820 projects in this year’s state level competition. MaryAlice Young placed first in Intelligent Machines, Robotics & Systems Software. She will present her project, entitled “Using a Computer Program Applied to an Electromagnetic Walking Apparatus to Simulate Earth’s Gravity in Space,” at Intel ISEF, May 12-17, in Phoenix, Arizona. Her work included writing a computer program and creating a walking apparatus to simulate gravity on earth. She plans to continue her project next year and hopes to design a space suit which could be worn by astronauts. Mailene Miranda received a recognition award in the cellular/molecular biology & biochemistry category for her project, “Physicochemical Properties of Various Fibers of Musa acuminata and Ananas comosus.” Mailene tested banana and pineapple fibers under different conditions to determine their strength. Her goal is to replace nonrenewable synthetic fibers with natural fibers that will have the same strength but be environmentally friendly. Lauren Massais and Lily England received an honorable mention for their team project in the chemistry division. Their project, entitled “The Effects of a Hydrophilic Substance on Polymer Chains and Cross Link,” focused on the need to find a solution to help combat plastic pollution. They created different plastics with ingredients to work towards making common plastic waste biodegradable.